Sew what's cooking with Joan! 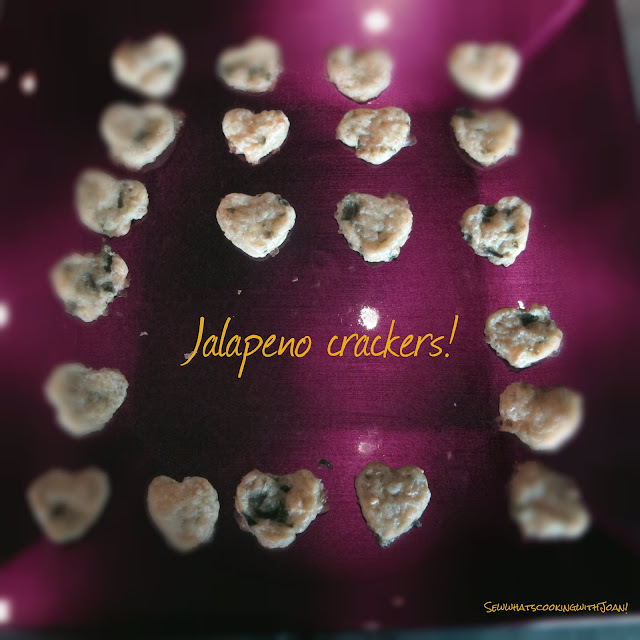 : Nibble, nibble Jalapeno crackers! As November kicks into high gear, it's time to start thinking about Thanksgiving. From now until turkey day we will be offering some dishes for you serve up for your Thanksgiving feast. These dishes are guaranteed to create the most tasty Thanksgiving yet. In addition I will be giving you a unusual craft, that you could make before Christmas!! Sweet One has her hands full this week with a full interior color change on the walls of her and TT's new home and the addition of an in home gym!! I can't wait to see it!! Her house is swarming with workers and she can't get near her kitchen!! She promised to be back next week with a yummy dessert for Thanksgiving! 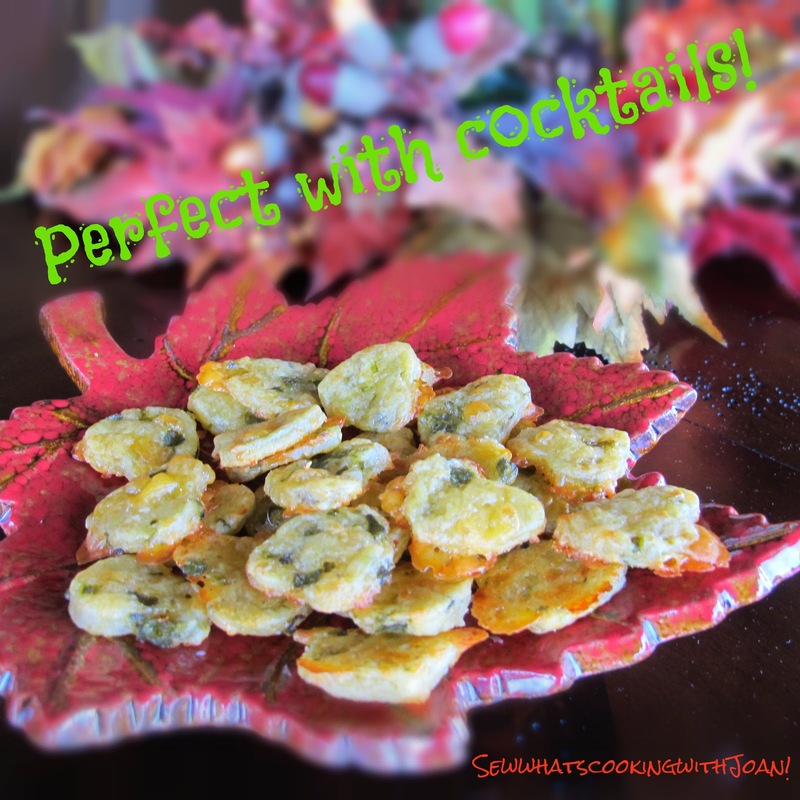 Count Down six blogs to Thanksgiving!! Turn the oven broiler on high and place the jalapeños on a sheet pan. Stick the jalapeños directly under the broiler for a few minutes on each side, until the skin is blackened. 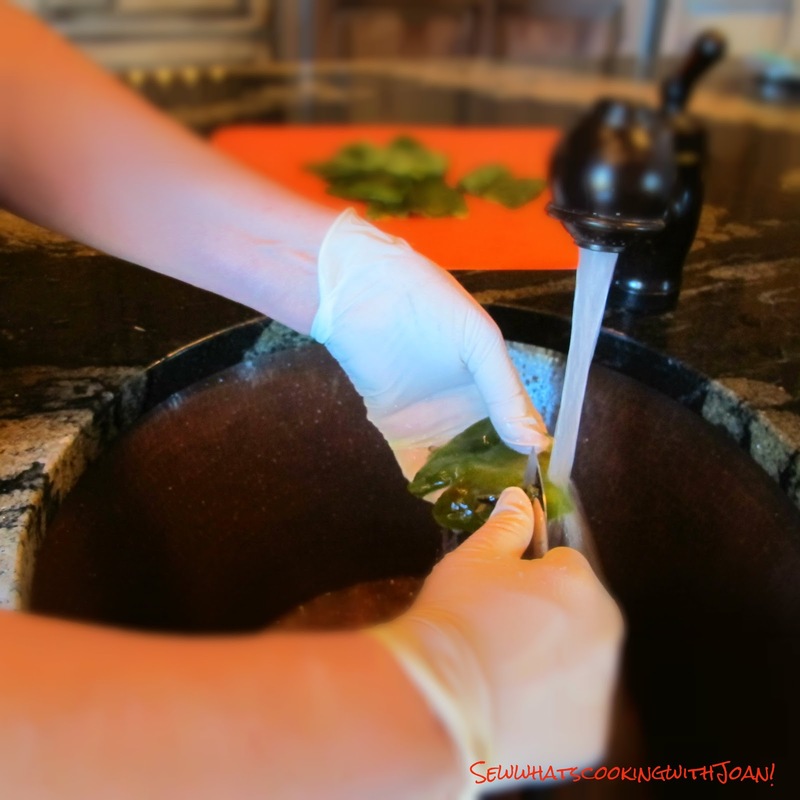 Place the blackened jalapeños in a bowl and cover the bowl tightly with plastic wrap. 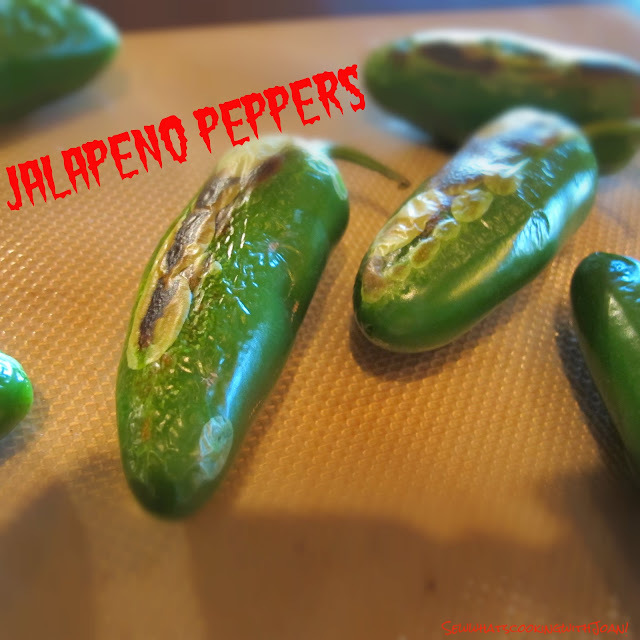 Let the jalapeños sit for 10 minutes to steam, then peel the skins off. Remove the stems and inner seeds, and chop the peeled jalapeños finely. Set aside. Be sure to use rubber gloves and do not touch your eyes ...those peppers are hot! In a stand mixer fitted with the paddle attachment, mix together the cheddar, butter, salt, pepper, and chopped jalapeños (but do not add any excess jalapeño juice) in a stand mixer on medium low for 60 seconds, until the butter is broken down and everything is distributed. Add the flour and mix until just combined (it will look crumbly but should pinch together well). Do not over mix the dough, or your crackers will be chewy instead of crisp. 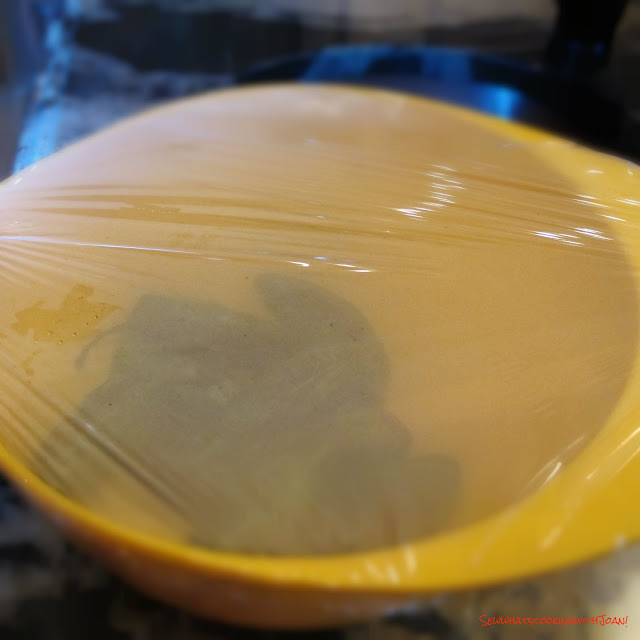 Scrape the crumbly dough out into plastic wrap, shape it into disk and refrigerate for 2 hours until firm. Preheat the oven to 350 degrees F, and line a sheet pan with parchment paper. Roll out one half of the dough at a time (keep the other half cool in the fridge), and roll the dough out to about 1/8 to 1/16th of an inch thick on a lightly floured surface. Use small cutters to cut out little shapes from the cracker dough, and place on a sheet pan. Make sure that your cracker shapes are no larger than about the size of a Cheez-It. If the shapes are too big, they won't crisp. Bake the crackers for about 9-10 minutes until crisp, golden, and puffy, then let them cool completely. Repeat with the remaining dough. Grab your Manhatten and enjoy! *Note: there should be enough moisture from the jalapeños that you shouldn't need to add water to the dough. If the dough is too crumbly, you may add 1-2 tbsp of water, I needed to add about a tablespoon of water to mine. But we are at a high altitude. Hope your weekend is full of fun, family and friends! !